The tree squirrel is a very special animal. It is one of very few wild animals that have adapted to humans and learned to coexist with man. It can live on both natural foods and hand outs. The squirrel is an acrobat with its movements and daring high wire acts, as it races through the tree branches. Its determination to find a way to get seeds from a so called "squirrel proof" bird feeder is amazing to watch. With its large bushy tail it makes it the most recognized mammal on Earth. There are over 365 species of squirrels in seven families. They include the tree squirrel, ground squirrel, and flying squirrel. Plus many squirrel-like mammals such as the gopher, ground hog and prairie dog. Squirrels are the most active in late winter, when the mating season begins. Squirrels are usually born in the early spring. The average litter consists of four. This varies with climate and location. A second litter can occur in mid summer, if there is an adequate food supply. In the summer squirrels are most active two to three hours after sunrise, then they'll rest in the afternoon. Resuming activity again two hours before sunset. The squirrel will retire to its nest well before dark, and will rarely leave the nest in the dark. In the winter, the squirrel will complete its activities between dawn and mid-day, and will remain in or around the nest until the next day. 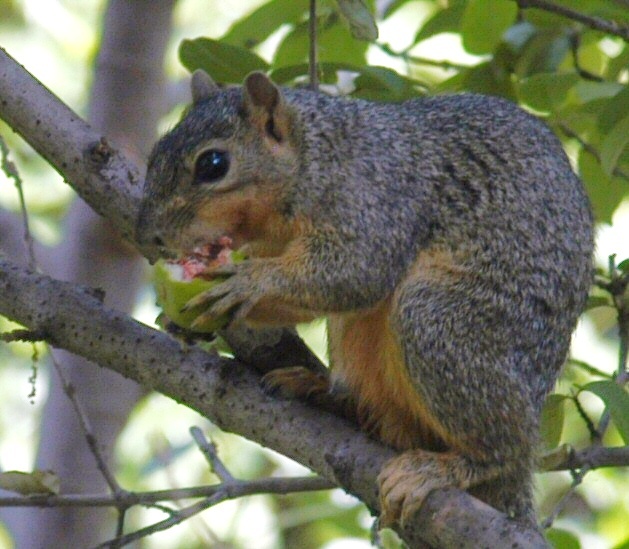 Squirrels chew on tree branches to sharpen and clean their teeth. That's why you may see many small branches on the ground around large trees. They will also chew on power lines for the same reason, this has caused many major power outages throughout the country. How to Repel Squirrels: We have gotten good reports that a spray of Tobasco sauce at 1 oz. per gallon of water repels most rodents including mice, rats, rabbits and squirrels. Good repelling also results from putting peppermint oil on cotton balls. How often these repellents will have to be redone will vary from site to site and depending on the weather. 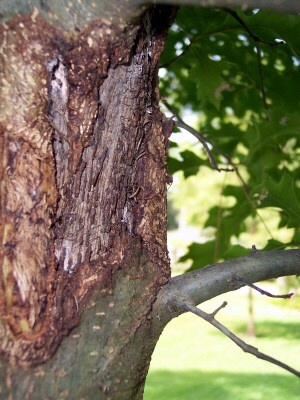 A: Animal damage like this cause severe injury to trees or shrubs. If the damage is all the way around the trunk, the tree will not survive. To prevent this problem in the future, increase the health of the soil and the tree. This tree is at least 6" too deep in the ground. 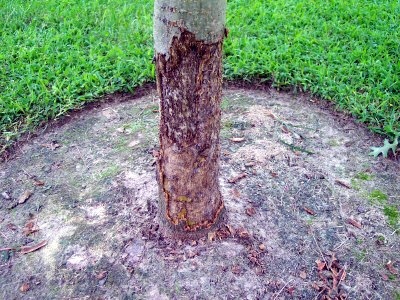 Its root flare should be exposed and any circling and girdling roots should be removed. Q: How can I keep squirrels from gnawing bark off of my trees? A: Try spraying the trunk with hot pepper tea although the damage is mostly cosmetic rather than health damaging. Q: What can I do to control the squirrels in my yard? A: Squirrels have always been one of my hardest to control pests. Digging out pots, is one of their favorite things. It can be stopped by mulching the pots with lava gravel.